kindle « When pen hits paper. I want people to read “Echoes”, and hopefully the rest of the Storm Series, and you really do need to hear the highly talented, American voice actress Cari Scholtens, who voices the Audio edition. So when I discovered three cheap way for you to buy both or either I thought I would share . Please note this only works in the USA and UK. If you have already bought the Kindle edition of ‘Echoes of a Storm’ then because of the Whispersync from Amazon you can buy the Audio version for only £2.99. that’s a huge saving of £16.40 on the audio version. Simply go to ‘Echoes page’ and click on Audio book. The second way – You own neither. If you own neither, then simply buy the Kindle edition first (remember you can download the Kindle app onto most devices) in the USA this will cost you $1.29 in the UK it will cost £0.99. Then once you have down loaded the Kindle version. Simply go back and buy the audio for the reduced price. In the UK this means that you can get both for £3.98. The third way – you just want the Audio version. If you have never used Audible before then you can sign up for a 30 day free trail and use one of your two free books choices to pick “Echoes of a Storm”. But don’t forget to cancel before the 30 free days are up. So, grab a copy of ‘Echoes’ now. sit back with a coffee and a muffin and either read or listen to a fantastic story. Just as well that I am not superstitious. I’m not too sure if that is a good or bad omen for a Dark Fantasy Book! Its taken me three years but I finally can say I have a No.1 book in the UK and I cannot stop smiling. 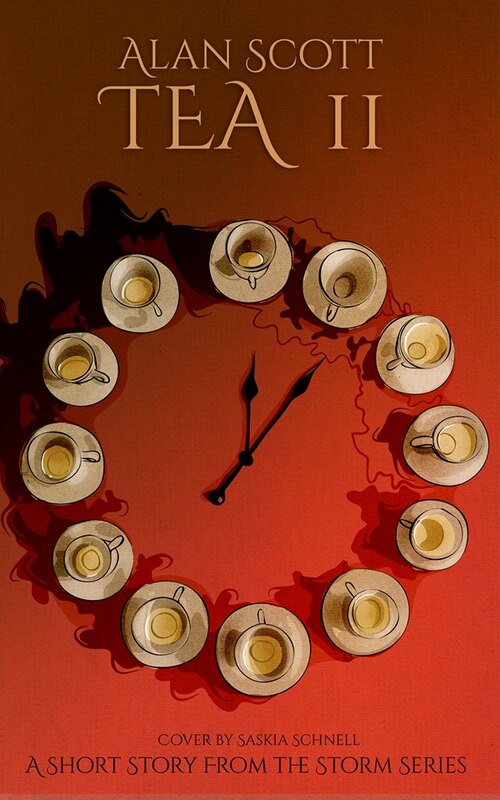 The story of ‘Tea’ is about a six hundred year old werewolf having tea with a seventy year old gay tailor. However, that is just the story it’s not what the book is about. The book is about – Being old, living with the choices you make through your life, unusual friendships, family, being brave, hiding what you are from the world and loneliness. ‘Tea’ is taken from a book of short stories called ‘Stories for a Storm Filled Night’, and is the most successful of my short stories released under their own cover. It has been downloaded just under 800 times around the world including USA, Canada, Mexico, Brazil, UK, Germany, France, Spain, Italy, Japan and India. ‘Tea’ is part of ‘The Storm Series’ set of books, which currently include a trilogy, three books of short stories and a number of promo stories. 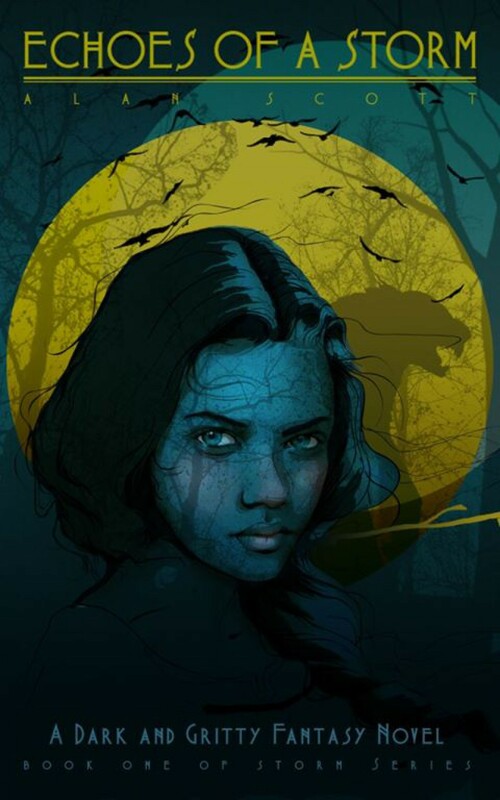 The ‘Storm Series is an adult, bittersweet, dark fantasy series that deals with relationships, loss, power, prejudice and ultimately, the true ‘monster’ that lurks inside of us. Just a quick post to say that ‘Tea II’ (ebook) will be on free promotion from Amazon between Thu 13 Mar and Mon 17 Mar 14. A Dark and Hungry Storm – Just over 6’500 words. This was my first attempt at book of short stories and although I am happy with all of them, its not until Brethren of the Night I does the really book come into its own. If you are outside the UK then just search your Amazon site for “The Storm Series Alan Scott” and click on the book. ‘Tea’ is taken from a book of short stories called ‘Stories for a Storm Filled Night’, and is the most successful of my short stories released under their own cover. It has been downloaded just under 700 times around the world including USA, Canada, Mexico, Brazil, UK, Germany, France, Spain, Italy, Japan and India.